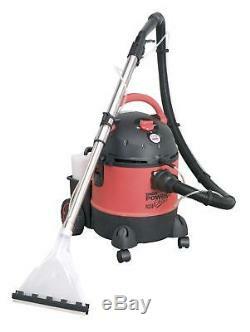 Sealey PC310 Valeting Machine Wet & Dry with Accessories 20ltr 1250W/230V. Grade A Unit - Unused item with damaged or no packaging. Unit may show signs from testing. Cleans carpets, car interiors, fabrics and upholstery. Constructed from high impact plastic which is dent resistant and rustproof. Supplied with carpet lance, hand held lance, full wet and dry vacuum accessory kit, including stainless steel telescopic rigid extension tube, cartridge filter and foam filter. Powerful pump forces cleaning fluid into fabric/carpet and 1250W suction power leaves surface virtually dry after one pass. Features safety shut-off for wet operation. Large capacity drum with external detergent tank for easy filling. Fitted with two fixed wheels and two castors. Cable storage hook, accessories and extension tube holders on head plus additional accessory storage slots on base. Please note: Images are for illustration purposes only. Timothy Wood Limited is one of the longest established hardware stores in the country. Established in 1926 by Timothy Wood, the company started out supplying the vast textile era on the early nineteenth century through today the company has three aims, Service , Value and Fairness. Trade counter situated next to the football stadium in Huddersfield West Yorkshire. Timothy Wood Limited is a family run business and offers a more personal service than national companies, going that one step further to meet all our customer expectations. We supply a wide range of hardware, ironmongery, fixings, sealants, power & machine tools, ladders and more sourced from trusted manufactures to obtain the best products at great prices. We have been trading successfully online since 2004 and have built a good relationship with customers within the United Kingdom and beyond. The website is maintained by Jay and Dean two family members who are the new generation of Timothy Wood Limited , with long experience of the Architectural Ironmongery, Power/Hand Tools and Engineering products backed by staff who have been with the company since the 1960s. This all makes Timothy Wood Limited your ONE STOP SHOP for all your needs; please review our web site and thank you reading the above. In order to receive this, your item must be paid for before 2.30pm that day. Although we dispatch the goods on a 24 hour service, it is not always guaranteed. Our couriers will be leave goods on site without some form of signature. If damaged goods are not signed for damaged, it will be your responsibility to return them at your own cost. If you are carded twice, the goods will then be sent back to ourselves. Our carrier will charge us for trying to deliver the goods and then charge us for returning the goods. This charge will be passed onto you. Deliveries to the following post codes. Deliveries to Southern Ireland will require an additional charge which needs requesting before purchasing. However, should you require to return any product, we will allow you to do so within 30 days of the day after receipt. You will have to arrange the return of the goods yourself and track them using a reputable carrier at your own expense. Returning an item that is faulty within the first 30 days of receipt. We will arrange the uplift of the goods on a day convenient for you (Monday to Friday). Returning an item that we have supplied incorrectly. If we have supplied an item incorrectly we need to be notified within 30 days of receipt. We will arrange the uplift of the goods and have the correct item sent out at the same time on a day convenient for you (Monday to Friday). Although this will be arranged on the same day, it is not guaranteed the collection driver will be the same driver delivering the goods. Our members of staff are always happy to help. The item "Sealey PC310 Valeting Wet & Dry Carpet Cleaner Valet Machine + Accessories" is in sale since Monday, December 24, 2018. This item is in the category "Vehicle Parts & Accessories\Car Accessories\Car Care & Cleaning\Other Car Care & Cleaning".